As some of you may know, my day/night/weekend job is as an event planner for a catering company here in Brooklyn. Part of what I do is discussing menu ideas with couples/clients and discussing how to bring their backgrounds, family recipes and inspiration from their favorite restaurants into their menu. Recently a couple had mentioned how much they love Blue Hill Farm’s “tomato burger,” so I had our chefs do a take on it for their tasting. I got to sample it myself and was so obsessed with the balance of sweetness from the “bun,” the savory tomato and the creamy goat cheese, I made a mental note to try it at home. 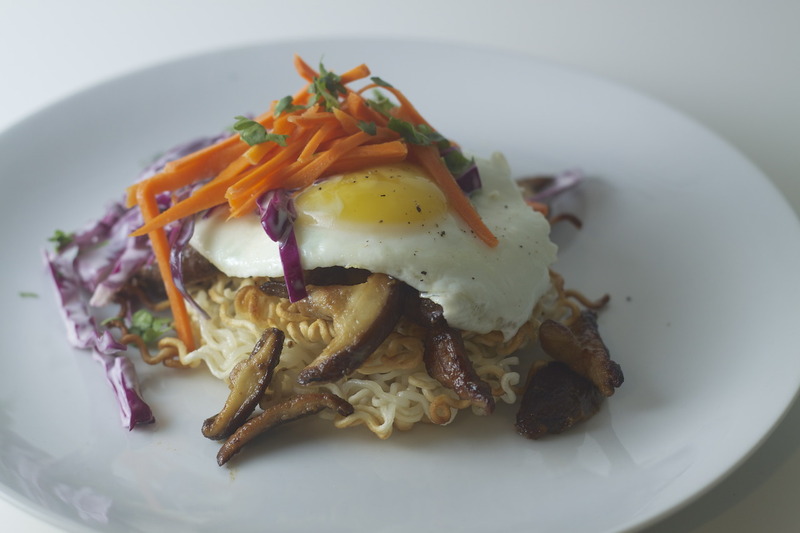 As someone who loves savory and sweet breakfast foods together (“don’t judge me!” I exclaimed as I dumped syrup all over my eggs and potatoes the other morning), I thought this would be perfect with a delicious sunny side up egg on top. Preheat oven to 325. Coat a 9×9 baking pan with cooking spray. In a bowl, whisk together dry ingredients. Pour in egg whites and whisk with dry ingredients until combined. Continue to whisk and slowly add olive oil in a stream. Pour into baking pan and bake on middle rack for 20-25 minutes or until golden yellow. Remove from oven and allow to cool.Tomato Filling: 2 pounds ripe Tomatoes1 cup Sundried Tomatoes in oil, drained and finely chopped1/4 Tbsp Shallots, finely chopped1/2 Balsamic VinegarCut a shallow x in the bottom of the tomatoes. Blanch in boiling water for 30 seconds. Remove from heat and run under cold water. Skins should easily slip off. Remove seeds and chop into a small dice. In a bowl, toss together diced tomato, sundried tomato, shallots, balsamic vinegar and season with salt and pepper. Stir together all of the ingredients and set aside. Melt butter in a pan. Crack eggs into pan and cook on low/medium heat until whites begin to firm up. Cover with lid until whites are about done. Season with salt and pepper.To assemble:Cut a four rounds out of the “bread.” Layer each with some of the goat cheese, a generous amount of the tomato filling, fresh basil and top with an egg. Serve hot. It’s a slow rainy Saturday in New York. In a saucepan 1/2 cup of water and 1 cup Vegetable Broth to a boil. Add quinoa and season with a bit of salt. Cover and bring down to a simmer until the liquid cooks off (about 15 minutes). In a saute pan, saute minced garlic in a bit of olive oil until soft. Add the cooked quinoa and toss. Cook on low heat, continuing to cook off any remaining liquid in the quinoa. In a blender, liquify basil, scallion and a 2-3 tablespoons of olive oil. With the blender going, slowly stream in the white wine vinegar, which will thicken the puree. In a saute pan, saute the kale and tomato in a bit of olive oil until soft. Add to quinoa and toss. Season with salt & pepper. In a saute pan, melt butter over low-medium heat. Crack the egg into the pan and season with salt and pepper. Cover with a lid until the whites have firmed up. 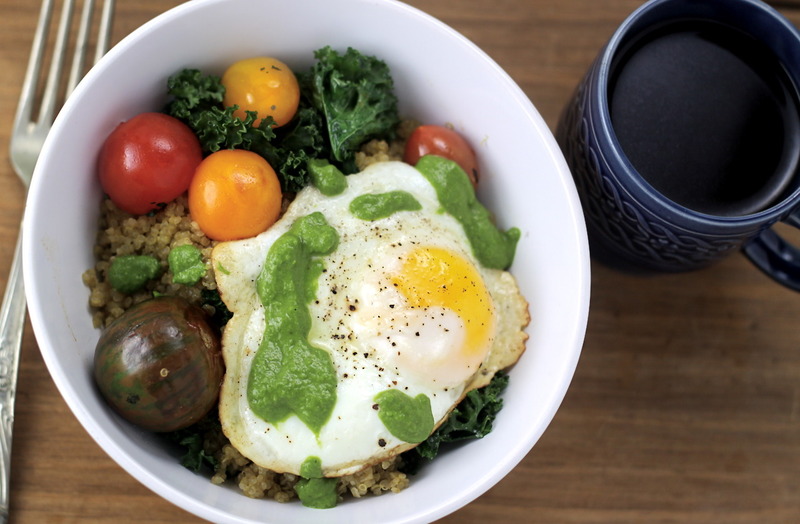 Serve quinoa in a bowl, top with the sunny side up egg and spoon some of the basil & scallion puree over the top. Serve immediately.